Since Sean and I have been on our own for the last couple of weeks while Michelle is away on business, we have been trying to make dinners a little simpler than normal since it is just the 2 of us. This means making a lot of much smaller meals and a few things that we might not make all the time because they may not necessarily be among Michelle’s favorites. I had a bunch of chicken I had purchased recently and was looking for something easy to do with it when I decided to make some chicken sandwiches. At the same time, I have been craving Buffalo chicken ever since the Super Bowl and was looking for a way where I could combine the 2 into a nice sandwich. 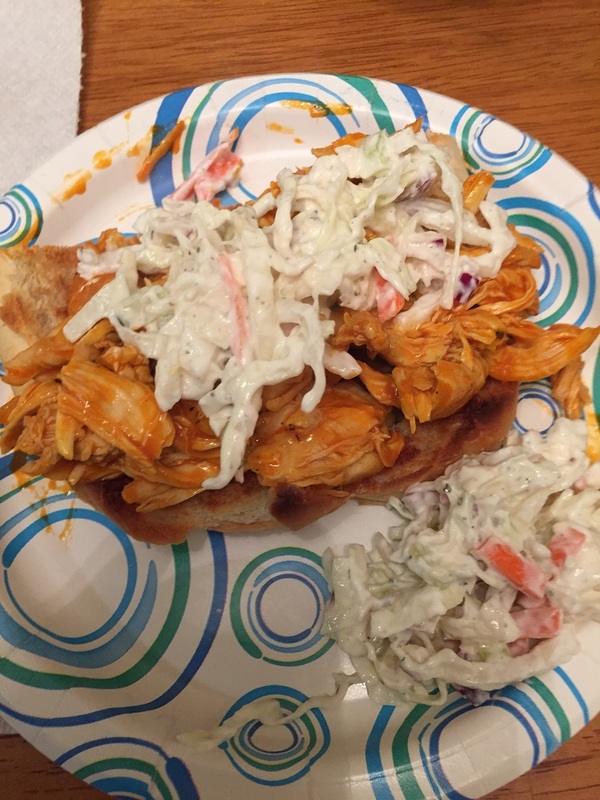 I came across this particular recipe at Kitchen Daily for an open-face Buffalo chicken sub sandwich with a very simple ranch slaw dressing that makes use of yogurt instead of mayonnaise. It does take a little bit of planning ahead to cook the chicken and then shred it for the sandwiches but it is still quite easy to put together. To prepare the chicken, pat the chicken thighs dry with paper towels and season both sides with salt and freshly ground black pepper. In a Dutch oven or a medium saucepan, heat the olive oil over high heat. When the oil is hot, add the chicken thighs and cook for about 3 minutes on each side until the chicken is golden brown. Add the chicken broth and the beer and reduce the heat to low. Cover the pan and continue cooking the chicken for one hour. While the chicken is simmering, begin to prepare the ranch slaw. In a large bowl, combine the cabbage, celery, carrot and red onion. Briefly set the bowl aside. For the ranch dressing, in a small bowl, combine the Greek yogurt, dried parsley, garlic powder, onion powder, dill weed, black pepper and salt. Pour the ranch dressing over the vegetable mixture and toss the vegetables to coat them well. Cover and refrigerate the slaw until you are ready to serve. After one hour, transfer the chicken thighs to a cutting board and shred them with 2 forks. Discard the cooking liquid. Return the shredded chicken to the Dutch oven and set the pan over low heat. Add the Buffalo wing sauce and stir until the chicken is well coated. Keep the chicken warm. Halve the rolls you are using and place them on a baking sheet. Place the rolls under the broiler for about 2 minutes until they are lightly toasted. You could also use a toaster oven for this step if you prefer. To assemble the sandwiches, divide the Buffalo chicken among the 4 grinder or sub roll halves. Top each half with plenty of ranch slaw and 2 tablespoons of the blue cheese crumbles, if using. Serve the sandwiches with additional ranch slaw on the side. You have a lot of choices when it comes to making the sandwiches. You could use the boneless chicken thighs or you can use boneless chicken breasts if you prefer to have white meat or that is what you happen to have on hand that day. You can use any Buffalo wing sauce that you like, but you want to remember that you are using the wing sauce and not just regular hot sauce. Wing sauce is a little bit thicker than traditional hot sauce and does not have the high concentration of heat that just hot sauce has. I know Frank’s makes a good brand of wing sauce and I personally like Sweet Baby Ray’s myself, but you could naturally use any kind that you like. You could even make your own by combining some hot sauce, melted butter and cayenne pepper if you prefer to go that route. I left the blue cheese off the particular sandwiches I was making but they would go well since it is a Buffalo sandwich. As for the slaw, I thought it came out great. The dressing is much thicker than what you would find in a traditional mayonnaise-based coleslaw, which to me really helped to make it great. You get good ranch flavor thanks to all the spices that use and the nice mix of the cabbage, celery, carrot and red onion really helped to make it stand out. 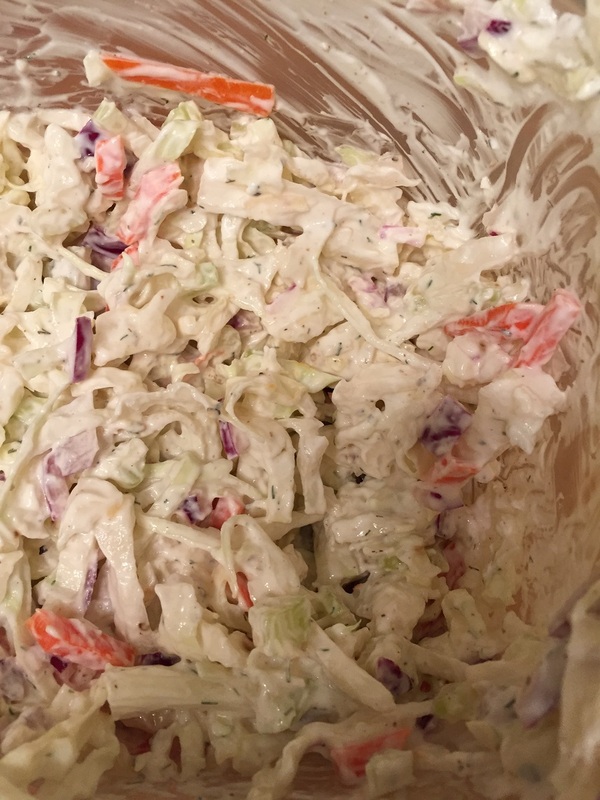 This would be a good coleslaw recipe to use for just about any sandwich that you like. I would definitely make these sandwiches again as they came together pretty quickly. Poaching them in the chicken broth and beer not only gave them great flavor but made the much easier to shred and pull apart.